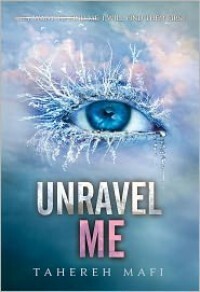 This review is also posted at The Bawdy Book Blog.Filled with beautiful, hammering prose, Unravel Me by Tahereh Mafi is The Book that is better than its predecessor. It is everything that was Shatter Me, and infinitely more. Without a doubt, Mafi’s writing is (still) some of the best I have ever read.Unravel Me takes flight two weeks after the conclusion of Shatter Me, and overlaps a portion of Mafi’s novella, Destroy Me. The first thing I noticed was a bit of regression in Juliette: ultimately, she stops striking through her own thoughts in Shatter Me, as she grows more confident, and less confused. In Unravel Me, the strike-throughs are back, albeit, not at as much a frenetic pace as the prior novel. It still shows a sort of backstepping in Juliette that is confirmed in the pages, as she gets to know her new surroundings at Omega Point, a place she is most unfamiliar. She didn’t want to be used by The Reestablishment and Warner. Is she being used by the others at Omega Point? And even if she is, does she serve a good purpose? This internal struggle – not the story or the scenes – reminds me of Mockingjay, when Katniss thinks she might be a pawn by District 13, but wrestles with herself to be okay with it, because she will serve a greater purpose. I’m very interested in seeing how this plays out for Juliette.The Love TriangleLook, I’m Team Warner, I’ve always been Team Warner and you ain’t neva gonna change my mind! I’ve always said Warner is redeemable, that he wants to be something other than what he is. His vulnerability gets its own expose in Destroy Me, probably wooing me even further, if that’s at all possible, and Mafi carries this over into Unravel Me, when she brings him together with Juliette – and of course the now famed #ChapterSixtyTwo. *wink*Adam Kent is something of an anomaly to me in Unravel Me. There are secrets about him that are exposed, and they took me by surprise. Most of the time, I can see a plot twist coming from a mile away, Tahereh Mafi managed to sneak up behind me and whack me upside the head with the very book I had in my hands. Now I’m left with even more questions than answers! Why do you do this to me?! *cries*KenjiKenji gets a real chance to shine in Unravel Me. He is a star in his own right, and he often makes demands of Juliette that most would think are unfair and heartless. But he cares for her a great deal. In fact, I wonder if the triangle is about to become a square, because sometimes I suspect he cares too much, and pines after Juliette himself, in his own, comical way. Kenji is many things in this story, but among them, the most important is an anchor. Forget his supersweet abilities, he is a foundation for people to rely on. Tahereh, do you think, maybe, possibly, we could get a spin-off about him if Juliette ends up with Warner or Adam? *wheedles* Oh, also maybe could you just make Juliette end up with Warner, pretty please?The Supreme Commander finally shows up in Unravel Me (although he’s in Destroy Me as well), and this is something of a shock to citizens since part of his power is in his absence. We finally get to view Warner and his upbringing from his perspective, and boy, do that kick me right in the – feels. The Supreme Commander is a unique personality, and I’m interested in finding out what makes him tick. Things… things are revealed, that interesting dynamic between father and son, and my heart goes out to them.One of the most interesting things though, are the titles about these books, and why I feel that Juliette and Warner are destined to be together. I think these titles reference Juliette’s effect on Warner, and they are the ultimate teaser to the ending of this series, because he makes references that harken back to the first title and well, frankly, the novella was all about him. I can’t wait to find out if they are destined to be together.Favorite QuoteI don’t know how to be a verb, an adverb, any kind of modifier. I’m a noun through and through.